If you are a parent, tutor or teacher who wants to learn more about Davis methods, the best place to start is with the book, The Gift of Dyslexia. The book will provide you with a new perspective on dyslexia and explain the theory behind the Davis approach. The book also contains a step-by-step guide to the essential techniques that are used by licensed Davis Facilitators to help individuals overcome barriers to reading and other common difficulties associated with dyslexia. 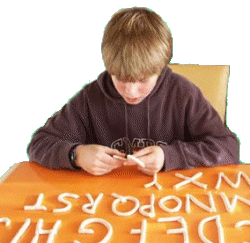 Do your kits have all materials needed for working with a child or other dyslexic individual? The Davis Young Learners Kit for Home Use contains all appropriate material for working with a young child, aged 5 to 8. The materials with this kit are geared to building early foundational skills for beginning readers. This kit is ideal l for home schooling or for parents who would like to give their young children a head start or extra support during early primary years. You should use the child's age rather than reading level to guide you in the choice of a kit. If you are unsure of which kit to buy because your child's age is borderline (about 8 years old), we recommend starting with the Davis Young Learners Kit. We feel that it is better to start gently and lay a good foundation with a child, so that both the parent and child can have a successful and enjoyable experience. The Davis Orientation and Symbol Mastery Home Kit is geared to individuals age 8 and over and contains all needed material for implementing Davis techniques in a home setting. If you are working with more than one child, a single kit can be shared; you can buy additional clay and koosh balls separately as needed.